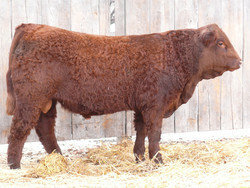 $6250 for Lot 34, MAC ULTRARED 262U, a red polled purebred Salers bull sired by GGT P Redford 18R and out of a daughter of RRF Robin Hercules. Sold ½ interest and full possession to a Peter Larson of Sheyenne, ND. $5000 for Lot 30, MAC UREILY 216U, a red polled purebred Salers bull sired by Big Sky Triton 40R and out of a daughter of SRS Navajo 9336N. Sold to West Hills Ranch of Fairview, WY. 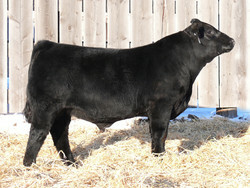 $5000 for Lot 99, MAC F1 UNIVERSITY 61U, a homozygous black polled 50% Salers and 50% Angus Optimizer Composite son of Mytty In Focus and out of a daughter of BEV Masterpiece 110H. Sold to Ward Ranches of Shingle Springs, CA. $4750 for Lot 81, MAC ULTRASONIC 285U, a black polled 75% Salers and 25% Angus Optimizer Composite son of MAC Navigator 281N and out of a daughter of CA Future Direction. Sold ½ interest and full possession to Rowell Cattle Co. of Ninnekah, OK.
$4750 for Lot 116, MAC F1 UPBEAT 115U, a black polled 50% Salers and 50% Angus Optimizer Composite son of SAV 004 Density 4336 and out of a daughter of S Nebraska 330N. Sold ½ interest and full possession to Justin Dikoff of Faulkton, SD. $4500 for Lot 3, MAC UNISTOP 157U, a red polled fullblood Salers bull sired by GGT P Blk Hold-Em 209R and out of a daughter of MBF Gold Bar. Sold to Hammond Ranch of Hardin, MT. $4500 for Lot 26, MAC UNBELIEVABLE 189U, a black polled purebred Salers bull sired by PCSL Spark and out of a daughter of RRF Robin Hercules. Sold to Marchant Ranch of Alladin, WY. $4500 for Lot 88, MAC ULTRA KEEN 2U, a black polled 62.5% Salers and 37.5% Angus Optimizer Composite son of MAC F1 Rainstar 15R and out of a daughter of BEV Masterpiece 110H. 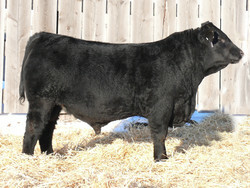 Sold to Erbele Ranch of Streeter, ND. $4500 for Lot 100, MAC F1 UNDERPASS 136U, a black polled 50% Salers and 50% Angus Optimizer Composite son of Mytty In Focus and out of a daughter of MAC Kickoff 200K. Sold to John Haefner of Mound City, SD. $4500 for Lot 101, MAC F1 UPSTREAM 139U, a black polled 50% Salers and 50% Angus Optimizer Composite son of SAV 004 Density 4336 and out of a daughter of BEV Garrett 26G. Sold to Russell Simons of Faith, SD. $4500 for Lot 102, MAC F1 UDALL 9U, a homozygous black polled 50% Salers and 50% Angus Optimizer Composite son of Mytty In Focus and out of a daughter of MAC Paratrooper 1P. Sold to Vernon Burkle of Gackle, ND. $4500 for Lot 118, MAC F1 UNBELIEVABLE 134U, a black polled 50% Salers and 50% Angus Optimizer Composite son of Mytty In Focus and out of a daughter of S Nebraska 330N. Sold to Bugas Ranch of Ft. Bridger, WY. $4500 for Lot 125, MAC UPBEAT 46U, a homozygous black polled 50% Salers and 50% Angus Optimizer Composite son of MAC F1 Sundance 4S and out of a daughter of TC Freedom 104. Sold to Bugas Ranch of Ft. Bridger, WY. $4500 for Lot 127, MAC ULONNIE 219U, a homozygous black polled 37.5% Salers and 62.5% Angus Optimizer Composite son of MAC F1 Rainstar 15R and out of a daughter of MAC Navigator 281N. Sold to Vernon Burkle of Gackle, ND. $4500 for Lot 128, MAC F1 UPDATE 163U, a black polled 50% Salers and 50% Angus Optimizer Composite son of SAV Net Worth 4200 and out of a daughter of MAC Fast Forward 128F. 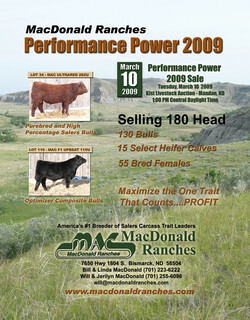 Sold to Erbele Ranch of Streeter, ND. $2700 for Lot 139, MAC ULISSA 225U, a black polled purebred Salers open yearling heifer sired by GGT P Redford 18R and out of a daughter of BEV Garrett 26G. Sold to Hannah Bugas of Ft. Bridger, WY. $2500 for Lot 138, MAC ULETIA 205U, a black polled purebred Salers open yearling heifer sired by SRI Nathan 01N and out of a daughter of AP Pld Dynamite. Sold to Z 7 Bar Ranch of Pawhuska, OK.
$2400 for Lot 132, MAC ULANI 18U, a black polled purebred Salers open yearling heifer sired by S Nebraska 330N and out of a daughter of D Century. Sold to Z 7 Bar Ranch of Pawhuska, OK.